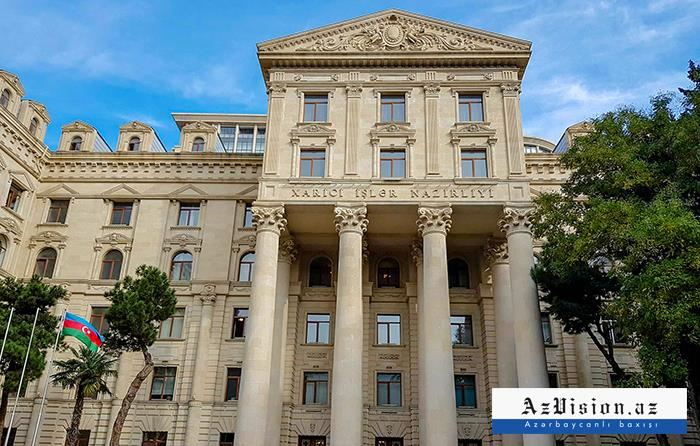 The Press Service of the Ministry of Foreign Affairs released a statement on the anniversary of the occupation of the Kalbajar district of Azerbaijan,1993 and April escalation, 2016. "On April 2, 1993 the Kalbajar district of Azerbaijan was occupied by armed forces of Armenia. Kalbajar located beyond the Nagorno-Karabakh region of Azerbaijan was occupied as a result of offensive operation mainly carried out from the territory of Armenia by use of heavy weaponry, Mi-24 helicopter gunships and advanced fixed wingaircrafts of Armenia. Natural mineral resources of Kalbajar are subject to illegal exploitation. Since 2002, Base Metals CJSC, which is a wholly owned bya subsidiary of the Armenia's Vallex Group CJSC, registered in Liechtenstein, has been exploiting Gyzylbulag underground copper-gold mine near Heyvaly village in the Kalbajar district. Since 2007, GPM Gold, a subsidiary of GeoProMining Ltd., has been extracting ore in Soyudlu gold mine. The satellite images show that exploitation of the resources in the mine is expanding. In response to the occupation of the Kalbajar district, the President of the UN Security Council issued a statement on 6 April, 1993. Then, UN Security Council adopted Resolution 822, which reaffirmed “the inviolability of international borders and the inadmissibility of the use of force for the acquisition of territory” and “demanded the immediate withdrawal of all occupying forces from the Kalbajar district and other recently occupied areas of Azerbaijan”. Following the adoption of this, the CSCE Minsk Group worked out the “timetable of urgent steps” to implement the resolution. Escalation of the situation along the line of contact on April 2, 2016 as the result of attacks by the armed forces of Armenia on settlements densely populated Azerbaijani civilians with heavy weapons once again demonstrated that the illegal presence of armed forces of Armenia in the occupied territories of Azerbaijan remains major threat to regional peace and security. In response to the attacks of Armenia, the Armed Forces of Azerbaijan have taken counter measures, which resulted in providing security for the Azerbaijani civilians residing in close vicinity of the line of contact through the liberation of strategically important territories and heights from occupation. The Armenian side, instead of wasting time and misleading its own people and the international community, must cease its policy of annexation and ethnic cleansing, and comply with its international obligations, as well as the demands of the UN SC resolutions and decisions of other international organizations".